Time to upgrade my NAS, Xobius. Currently it has 10TB (made up of 2 RAID1s of 1TB and a RAID5 of 6x 1.5TB). All of it is full. This is my scratchpad for planning Xobius II (on the cheap). FYI a Drobo Pro is about $2k…and it holds an underwhelming 8 drives. Why? I would normally go Intel but low-end Intel CPUs don’t support hardware virtualisation (see Operating Systems) or ECC RAM. Why? This thing holds 24 3.5″ SATA drives…and for that, it’s damn cheap. Why? Software RAID can use a lot of RAM when you have a ton of drives. I would usually go Corsair, alas Kingston are the only manufacturers that provide Unbuffered / Unregistered ECC RAM. Need ECC RAM to ensure no memory corruption in RAID but it needs to be unbuffered and unregistered as only server CPUs support it. Why? Integrated graphics, gigabit LAN, 6x SATA III ports. It also has 2 x8 AND x4 PCIe slots so that I can chuck in 3 SAS HBAs. The two PCI slots will be used for an extra Gigabit NIC and a Wireless NIC (for bridging two networks). Why? Corsair are awesome these days. Hard Disks use at max about 30W, 850W should be plenty. Why? This is how the drives connect from the Norco SAS SFF-8087 ports to the system. I need a total of 6 ports for all 24 drives (4 drives per port), so I need 3 cards (at 2 ports per drive). All are PCIe x4 so I need to use the 2 x8 and x4 on the motherboard. These are only SATA II as the drives I will be using are only SATA II. 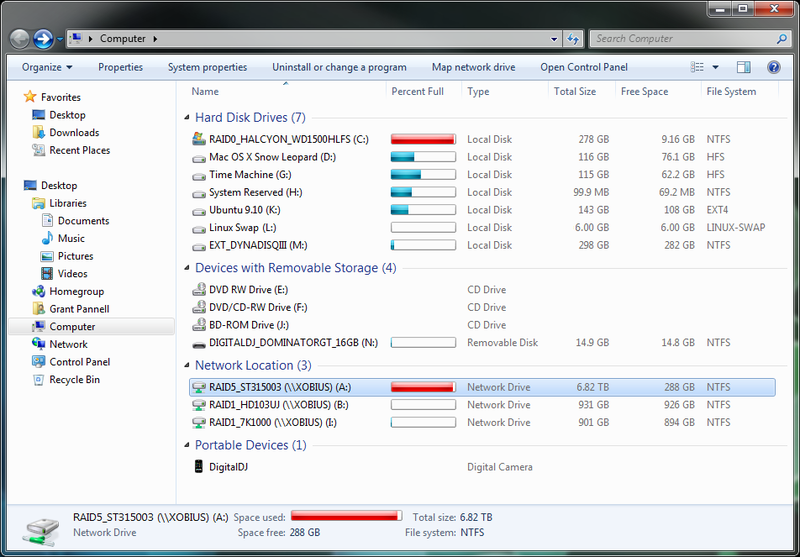 If in the future I need to upgrade, since I’m only getting 20 drives total, I will have 4 bays free. I can connect these 4 drives directly to the motherboard (which has SATA III), or a controller in the free PCIe x1 slot using a SFF-8087 to SATA breakout cable. Often users suggest using a HP SAS Expander which has 8x SFF-8086 SAS ports (6 to connect drives to card and 2 for uplink to the SAS HBA). I believe that by using this method you limit the amount of bandwidth you have as you are essentially plugging all 24 drives into a single SAS port (on the SAS controller). Using 3 controllers allows for maximum bandwidth allocation between drives. Why? The Norco case connects drive by SAS cables from the backplane. 6 ports, 4 drives per port. 6 cables to connect all drives to the system. Need many power connectors to power all the drives on the backplane and might need a SFF-8087 to 4x SATA cable if I wish to connect SATA III drives directly to the motherboard. Why? The only new drives will be the 2TB Hitachi drives. They’re cheap and fast…and NOT green power (TLER doesn’t matter in Unix-based systems…as much). Who likes green power drives anyway? Remember RAID used to stand for Redundant Array of INEXPENSIVE Disks. These are great value for performance. All raids pooled so that shows as single drive. Software RAID so that I can migrate the RAID to new hardware if a controller fails. I don’t normally blog about personal crap, but today…oddly, I was over productive. On top of it all of that I managed to watch numerous episodes of TBBT and Seinfeld….and play Angry Birds. If I was this productive every day…well…who knows what would happen.